The Gypsy Cutting Gizmo regularly priced $15.49, today $9.49. The Gypsy Gripper regularly priced $21.99, today $13.49. The Gypsy Little Gripper regularly priced $7.49, today $4.49. 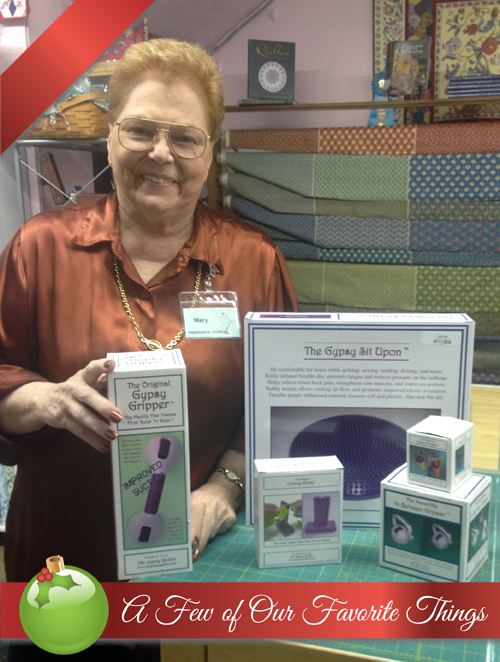 The Gypsy In Between Gripper regularly priced $16.99, today $10.49. The Gypsy Sit Upon regularly priced $35.49, today $21.49. The Gypsy Cutting Gizmo: The Gizmo is the extra hand you always need when separating chain-pieced segments of your quilt tops. It stands steady on your table, allowing you to safely cut chained pieces by holding the fabric with both hands and slipping the chain into the slot on top of the Gizmo. The Gypsy In Between Gripper: Comfortable to hold and easy to use, perfect for your larger rulers, templates and triangles. Features a large contoured grip handle and a large round suction cup with lock and release lever. A unique feature of this Gripper is its two-color installation indicator, which shows you at a glance if the suction cup is securely affixed to the ruler. Will work with smooth surface rulers that are at least 4-1/8" wide. A lightweight, heavy duty tool. The Gypsy Sit Upon: A softly inflated flexible disc used on chair seats to prevent fatigue, reduce pressure on the tail-bone, and help relieve lower back pain, while strengthening the core muscles and improving posture. It can be used on hard or soft chairs, recliners, car seats, or anywhere you sit.